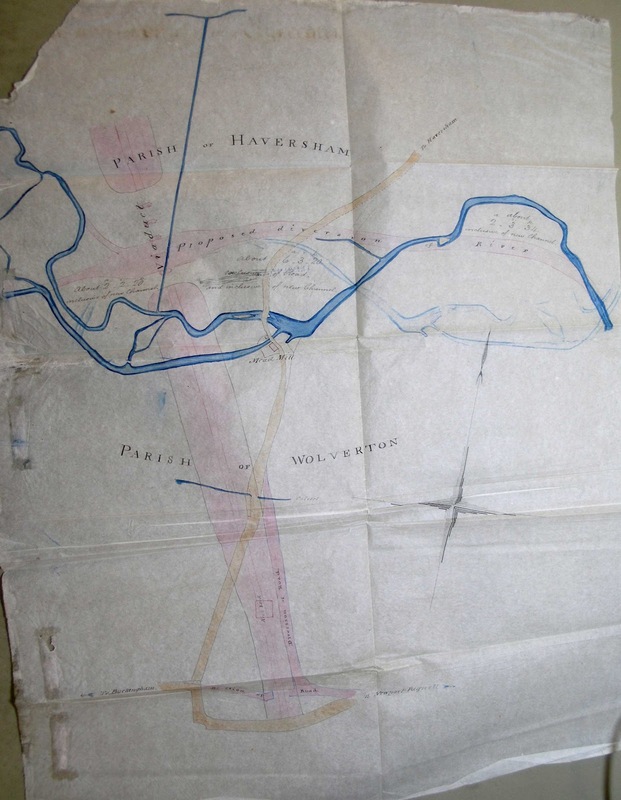 This plan of Wolverton I discovered last week attached to a report to the Radcliffe Trust by a man called Edward Driver. It is dated April 17th 1847. On of the issues that Mr Driver had to deal with was the encroachment on the field (here marked in red) by the residents of Wolverton who were setting up allotments at the back of Bury Street. There were even pigsties, according to Mr Driver. 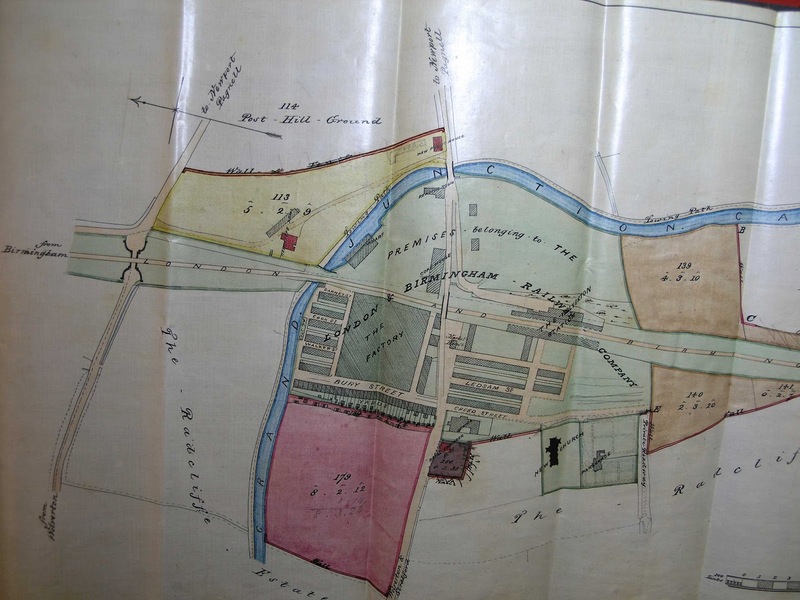 Mr Driver’s recommendation was to sell the field marked in red too the LNWR and build a high brick or stone wall around the railway property to prevent any further encroachments. He further suggested the sale of the two fields marked in brown. I am not sure that this sale was effected at this time, although it was done later. The field coloured yellow was the one leased to Clare and Congreve to build the Radcliffe Arms. Most of this became the Park in 1885. We can here see a clear drawing of the radcliffe Arms and its approach roads. One curiosity here is the proposal for a new pb on this land, more-or-less where the station entrance used to be. As far as we kow this was never built. All of the original streets are shown here, but you can see the extension of Ledsam Strteet and Young Street as pencil lines. These cottages were built in these years, as was the short extension of Creed Street, which was mainly shops. In 1086 two mills were recorded in Wolverton. They were not named but it is reasonable to suppose that they were on the sites of the later mills. The eastern mill became known as Meadow mill, or Mead Mill. The western mill, where Wolverton Mill now stands, was known as the West Mill. After the disappearance of Mead Mill in the 19th century the west mill became the Wolverton Mill. The railway put Mead Mill out of business. 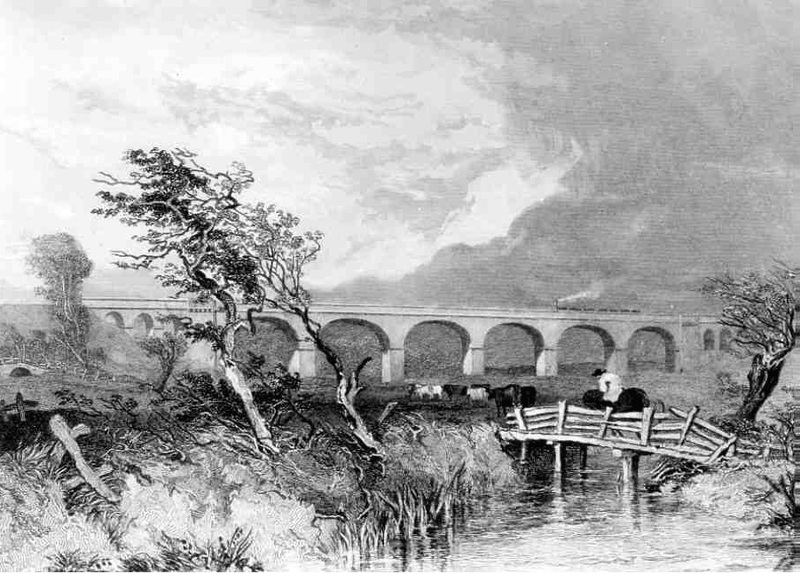 As the map shows, the new embankment and viaduct required the river channel to be diverted, leaving the old water mill without a water supply or a mill race. I assume that the mill owners made a conscious business decision to close down the mill and take the compensation. By this time (1837) there was less business for local mills and Wolverton could function quite well with use a single mill. The mill continued to be inhabited, according to subsequent censuses, for another 20 or 30 years. Then it was pulled down and little trace remains. As this plan illustrates, the embankment and new river course required that the Haversham road be diverted as well. 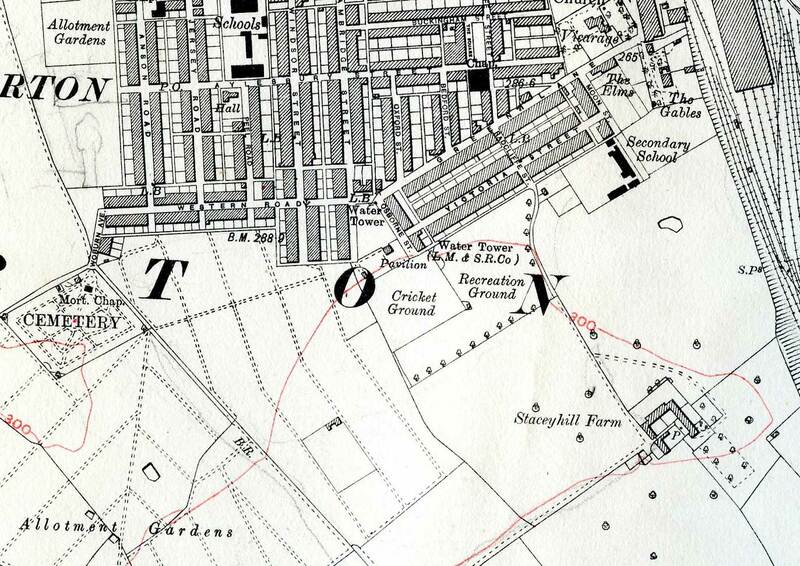 As you can see from this 1932 map redbrick Wolverton had reached the limits of its development. There was still demand for housing and the council purchased some land from the Radcliffe Trust which mainly too some fields from Stacey Farm. The entrance to Stacey Farm at the time was at the end of Radcliffe Street and the two cottages which still stand at the beginning of Stacey Avenue were once late 19th century farm workers’ cottages. The curve of Stacey Avenue follows the line of the old farm access road and this road, with its mostly semi-detached houses (at the time an innovation) became the first road or street in Wolverton that did not follow a straight line. 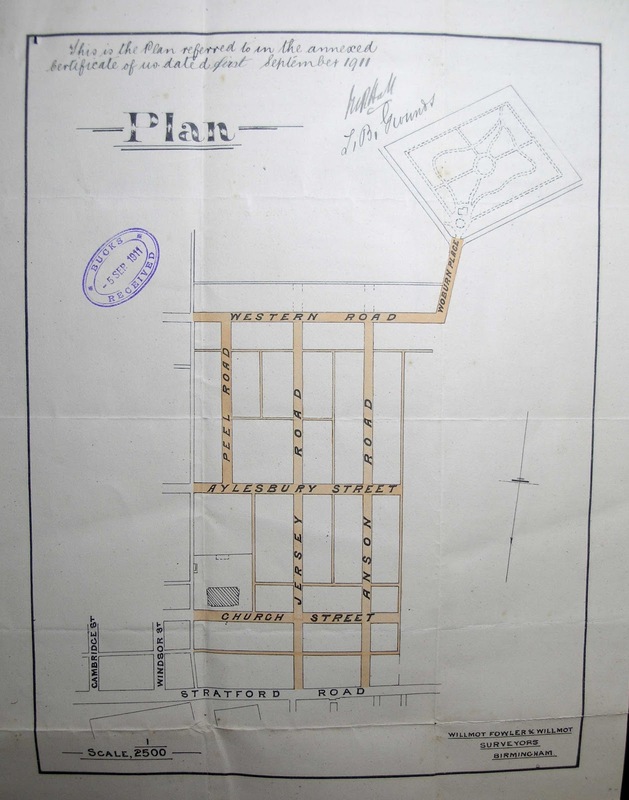 Two other streets were built at this time and Windsor street was extended. The new streets were named Marina Drive and Gloucester Road. This appears to have been another outbreak of enthusiasm for the Royal family. The Dukes of Gloucester and Kent were younger brothers of King George VI. Princess Marina of the Danish/Greek royal family married the Duke of Kent in 1934 and I believe she was a popular figure at the time. her husband, the Duke of Kent, was killed in an aeroplane crash in 1942. Eton Crescent, shown pencilled in on the map, appears to have been an arbitrary choice of name.Eton is/was in the county of Bucks and it is adjacent to Windsor. There were other choices of Buckinghamshire place names – High Wycombe (certainly the largest town at the time) and the Chalfonts, which had a close association with the old Wolverton barony, but neither of them made it to a Wolverton street name. In the 1940s another crescent was developed behind Western Road. This time the council went to the ancient field name and called it Furze Way. Further expansion came with the development of another Stacey farm field to the south of Gloucester Road. The approach road from Gloucester Road was named Woodland View, and the long road joining the Stacey Avenue extension was called Southern Way. In the middle was another crescent. This one was called St John’s Crescent. This last name I cannot explain. St John does not figure in any of the Wolverton or Stony Stratford churches, and Bradwell Priory, which it overlooks, was dedicated to St Mary. Any suggestions? This concludes this series. The development of Milton Keynes brought a new dimension to the naming of streets. The Radcliffe Trust had been reluctant partners in the building of Wolverton and they quickly regretted the sale of land at the eastern edge of the estate. Indeed they were resolute in their position that no further land should be swallowed up by the new town from 1840-1860. 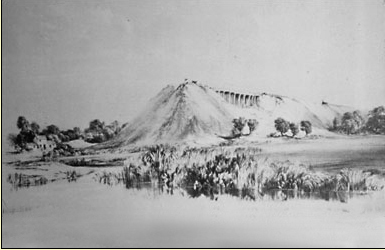 This is why New Bradwell came into existence in the 1850s. Gradually as we have seen they ceded more land to the expanding town and in the 20th century the Trust decided to act as property developers themselves. A block of land had already been reserved and built upon in 1896, when the new Boys School opened, and in 1906 a new Girls and Infants School opened fronting Aylesbury Street. These streets were now extended and new north-south streets were developed by the Trust and sold privately. These new streets were named after Trustees of the Radcliffe Trust. Jersey Road was named after Victor Albert George Villiers, the 7th Earl of Jersey, who served as a trustee from 1884 to 1915. Anson Road got its name from Sir William Reynell Anson, Bt. who was a trustee from 1888 to 1914. Peel Road was named for Arthur Wellesley Peel, 1st Viscount Peel who served as a trustee for 36 years, from 1872 to 1908. And Woburn Avenue was named for Herbrand Arthur Russell, 11th Duke of Bedford who became a trustee in 1900 and retired in 1913. At that time Bedford Street (not named after the Duke of Bedford) was already taken, and there was a Russell Street in Stony Stratford, although that street was named after a Russell of humbler origins. Each of these men came from well-established aristocratic families, which will give us some sense of the kind of people who were invited to become trustees. The Villiers family became prominent in the 17th century when one of their number became Duke of Buckingham. Viscount Peel was the fifth and youngest son of Sir Robert Peel who was one of the country’s distinguished 19th century Prime Ministers until his death in 1850. He had also served as a Radcliffe Trustee from 1828 until his death. Family connections were strong in the Radcliffe Trust in those days. Viscount Peel’s sister had married the 6th earl of Jersey and his fellow trustee, the 7th earl, was therefore his nephew. The Russells had become part of the establishment in the 16th century. They inherited Bloomsbury in London through marriage to one of the earl of Southampton’s daughters and by the 19th century were enormously wealthy. Anson’s family rose to prominence in the early 19th century. He was a lawyer and distinguished jurist and, amongst other offices, was Vice Chancellor of Oxford University in 1888. Had the line of Green Lane continued it would have cut through the southern blocks of Cambridge and Windsor Streets and rejoined itself beside the cemetery, but it looks as though someone decided to square off the angles that characterised the ends of Bedford and Oxford Streets and thus the extension of Green Lane became Western Road. The demand in the last decade of the 19th century was apparently for larger houses. Front gardens also became a new feature and bay windows were standard. Cambridge Street and Windsor Street extended the town further to the west and the south side of Green Lane, Victoria Street and Osborne Street rounded off this Victorian period of housing construction. Cambridge Street was so named to complement the existing Oxford street and Green Lane took its name from the ancient trackway that had been well-travelled for at least 1000 years. The other three streets war coincident with Queen Victoria’s diamond jubilee and this encouraged an outbreak of royal enthusiasm to name one street after the Queen, another after her favourite Isle of Wight house, and a third after Windsor Castle. At this time also another short one-sided street was built at the eastern book end of Victoria Street. This was named Moon Street after The LNWR’s long serving chairman, Sir Richard Moon.